You are here: Home » Vendors » Are Bynder Orbiting Or Departing From Planet DAM? Are Bynder Orbiting Or Departing From Planet DAM? Last week, DAM vendor, Bynder announced the release of a ‘creative files management’ tool called Orbit. There is a waiting list to get an account, so I will have to defer any assessment of its capabilities for a while. I have not yet encountered anyone who has been approved so far and I am hoping this isn’t vendor vapourware PR, but the more likely reason for a staggered rollout by Bynder is probably concern about being swamped with people wanting to check it out and servers crashing etc as a result, therefore, I am prepared to give them benefit of the doubt on this occasion. A basic Orbit account is free of charge. The free plan capacity is 10GB with 10GB data transfer. I believe this is less capacity than you get with Google Drive (which is 15GB), the same as Box ‘s 10GB but quite a bit more than Dropbox’s more modest 2GB. Orbit might put other paid-for DAM Lite solutions at something of a disadvantage, but to what extent that is the case remains to be seen; a few of those already active in this segment may not have viewed Bynder’s announcement with unbounded enthusiasm, however. Arguably some of the other non-free DAM applications targeted at the ‘value’ end of the market are functionally superior (at least on-paper) but if you are a price-sensitive DAM software buyer, zero is a hard number to argue with. 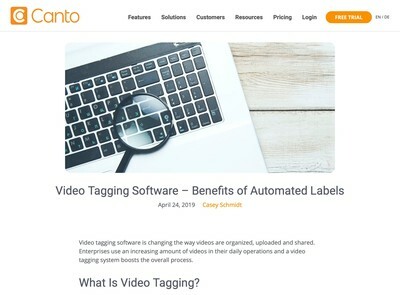 In this article, I want to try and dissect some of the implications of this update for the rest of the content-oriented DAM software market, especially as it relates to the commercial environment this product is being released into. 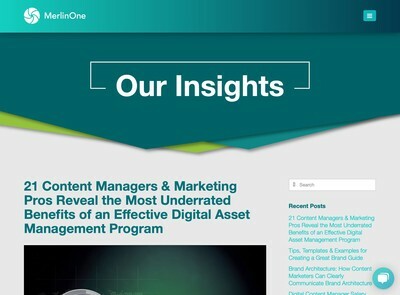 The first interesting point is that they refer to it as ‘Creative File Management’, not ‘Digital Asset Management’ in the marketing materials. The reasons why they have done this are not entirely clear, it could be because they don’t want to directly compete with their paid-for platform. Alternatively, it might be that this is an attempt to provide an answer to Dropbox, Google Drive, Box etc (noting that a lot of the users of the aforementioned services might not have much of an idea what Digital Asset Management is). 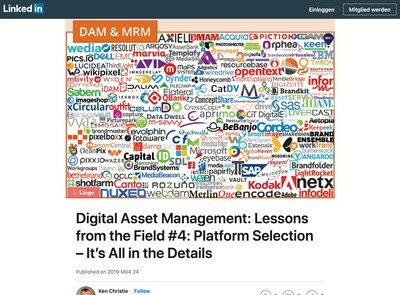 Based on the positioning, I believe the latter is more likely, however, this article by Emily Kolvitz refers to it as a Digital Asset Management system. Perhaps they want to present Orbit as a DAM to those who know what Digital Asset Management means and ‘Creative File Management’ for everyone else who doesn’t, but in trying to have their cake and eat it, there is a risk of some mixed messaging going on here which could hint at a lack of complete clarity about what the true purpose of Orbit is for Bynder themselves. When I reviewed Jeff Lawrence’s CMSWire article in 2015 (where the quote above comes from) I noted then that there seemed to be a conflicted attitude towards DAM on Chris’ part. On the one hand, it has negative associations like calling it a ‘database’ or ‘siloed’, on the other, it’s the reason why most of their current clients become aware of them to begin with. He seems to both dislike it but doesn’t want to lose the marketing benefit, even though it might be limiting the scope of where he would like Bynder to go as a business. This is a pattern repeated across the DAM software industry. DAM software is (and always has been) one of the least-loved B2B software markets. Users don’t really get passionate about it, but tend to wearily accept they need a DAM to manage the deluge of digital assets they keep generating. 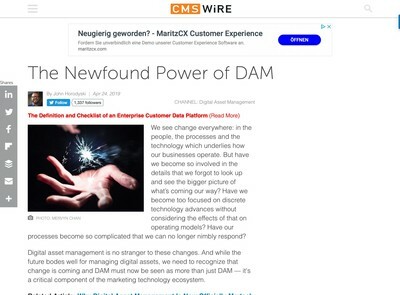 Vendors often end up disliking it because the market is fragmented, crowded with competitors and all the customers have a slightly different take on how it should be implemented, yet they also depend on DAM for their continued existence. DAM software is a bit like the equivalent of asking a thousand different people what colour they want their house to get painted and then having to deal with the resulting spectrum of requirements, ordering multiple tins of paint, brushes covered in the wrong colours, people changing their minds about their preference for blue over pink and vice-versa and others who want their door in green, but the garage in red etc etc. Fundamentally, DAM cannot scale as a single platform software business model. This is the reason revenues across the DAM software sector are more or less flat – the complexity of the products is not commensurate with the cost the market will afford (taken as a whole) and there are too many suppliers but still without enough differentiation to sustain all of them. The process playing out in DAM currently is a gradual (but relentless) destruction of the mid-market, i.e. market stratification (separating into distinct and totally separate commercial groupings). Most firms will believe they have only two options to deal with this trend. Either they seek out a much smaller number of enterprise engagements that have far larger budgets and present themselves as enterprise content management (to coin a phrase) or they compete for larger user numbers instead. I gather Bynder are financed by venture capital. Most VCs operate an OPM (Other People’s Money) funding model. This means that at some point they have to return the funds invested to their investors and with a decent profit. Further, there is a premium placed on liquidity (i.e. being able to give investors back their cash if they ask for it). By definition, free = no money, therefore user numbers are going to be where the action is in order to create something of value that can be realised into cash (or the ‘exit’ as VCs like to say). Essentially, Bynder are going to need to effect a beggar thy neighbour strategy in the DAM mid-market segment to realise their ambitions (and quite possibly to avoid having the plug pulled, themselves). The response from competitors like Dropbox, Box etc is probably going to be to add more DAM features since Bynder have just advertised this potential opportunity to them (if they even needed prompting). As such, you can expect a repeat of the features arms-race that occurred in the mid-market five or so years ago, but at the commodity end next (where Orbit is positioned). If that becomes the case, many end users might start to wonder why they are getting asked to fork out tens of thousands of dollars for Cloud software if it is now being offered for free with functionally that is not all that different. A further possibility is that despite being free, not enough users adopt it, but then where do Bynder (and their investors) go from here should that become the case? In 2017, the number of single-platform DAM software business models appears to be boiling down to just two: charge the most dollars or acquire the most users. Both of these options are fairly unappealing and I can’t see significant benefits for anyone, neither users who want functional and effective DAM solutions nor vendors who need to earn a living. It’s a measure of the poverty of ideas in the DAM software market (and all the consultants, analysts etc who claim intellectual superiority over their sell-side peers) that this is best anyone can come up with. I don’t think this is satisfactory and I know there are a quite a number of other people who share my opinion. I would recommend that those readers who are interested in the wider context of all this should consider Orbit in the context of some of the other subjects we have addressed on DAM News recently. Interesting take on Bynder’s Orbit. As you say, it remains to see what will happen, but I do think the way they are announcing it/advertising it within the DAM community is misleading and confusing. My company uses the paid-DAM from Bynder and my first thought after watching their trailer for Orbit was “Why am I paying for something they offer for free?” Orbit does have limitations in the storage space and functionality as compared to their full DAM option, but the initial marketing for Orbit glossed over this and did not make it clear. It will be interesting to see how it is received in the market and what that means for the other aspects of the company.